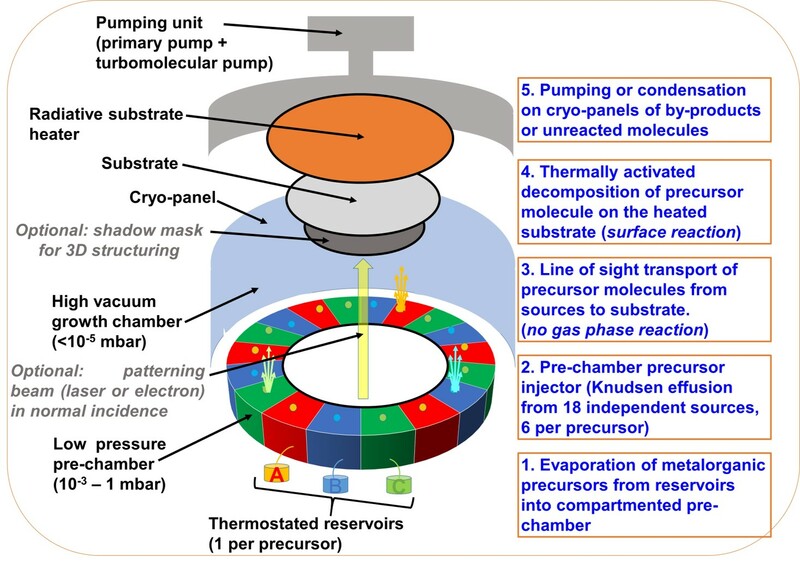 The schematic of the CBVD process in the Sybilla 150 equipment for the co-deposition from 3 precursors A, B, and C for the co-deposition of a material AxByCzOw is presented below. Chemical Beam Vapour Deposition (CBVD) is a thin film deposition technique operating under high vacuum conditions in which film growth occurs through the thermally activated chemical decomposition of precursor molecules at the substrate surface. The Sibylla 150 deposition equipment, patented and commercialized by ABCD Technology, allows deposition from up to 3 different precursors in several combinatorial configurations  (reversible to an homogenous deposition configuration ), enables 3D patterned deposits using stencil shadow masks (nanostencil lithography)  and is compatible with in situ electron or laser irradiation of the growing film .